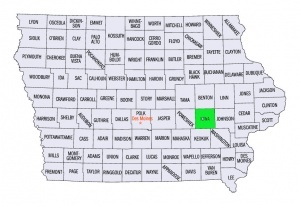 Iowa County, Iowa, located in the southeastern part of the state, is bounded on the east by Johnson County and on the south by Keokuk and Washington counties, all of which contain Men­nonite settlements. Amish Mennonites settled in adjoining Johnson County in 1846 and by the next decade the settlement had spread westward into Iowa County. The Upper Deer Creek Conservative Mennonite Church, the West Union Men­nonite Church (MC), and the Parnell Mission sponsored by the West Union Church, are located in the southeastern part of the county. Approxi­mately 500 Mennonites lived in the county in the 1950s. Gingerich, Melvin. "Iowa County (Iowa, USA)." Global Anabaptist Mennonite Encyclopedia Online. 1957. Web. 22 Apr 2019. http://gameo.org/index.php?title=Iowa_County_(Iowa,_USA)&oldid=95372. Gingerich, Melvin. (1957). Iowa County (Iowa, USA). Global Anabaptist Mennonite Encyclopedia Online. Retrieved 22 April 2019, from http://gameo.org/index.php?title=Iowa_County_(Iowa,_USA)&oldid=95372. Adapted by permission of Herald Press, Harrisonburg, Virginia, from Mennonite Encyclopedia, Vol. 3, p. 52. All rights reserved.